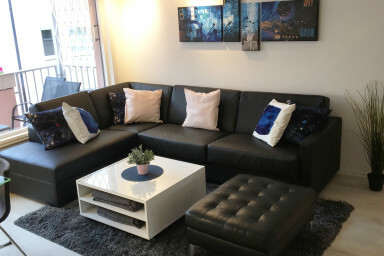 This flat by Sonderland Apartments is located in Oslo city center. It has 3 bedrooms, a living/dining room area, full kitchen and 2 bathrooms. This newly renovated, high standard flat by Sonderland Apartments has 3 bedrooms and can accommodate up to 12 guests. There are 8 single beds and one double bed. It has a living/dining room area with a sofabed, that accommodates 2 guests, and big flat screen TV. The open kitchen is equipped with kitchenware, a stove top, an oven, a fridge with freezer, a dishwasher and a coffee machine. There are two bathrooms, each with a shower. There is also a washing machine and a dryer. It has two balconies with small seating areas. Wi-Fi is free of charge, and there is an elevator in the building. The Royal Palace and Karl Johans gate, Oslo's main street with restaurants and shopping, is only 4 blocks away!